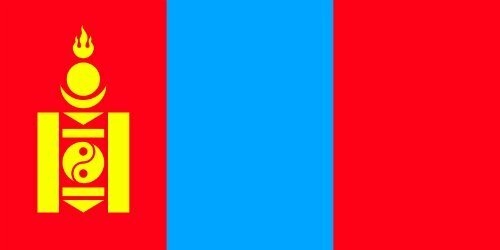 The Mongolia flag consists of 3 vertical colored stripes: red, blue, red. 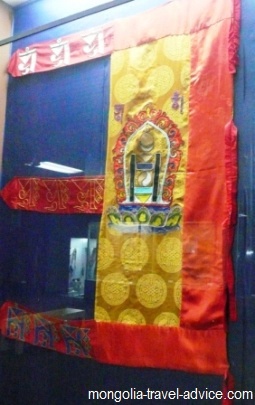 Within the left-hand stripe is the Buddhist Soyombo symbol, which has become the national symbol of Mongolia. 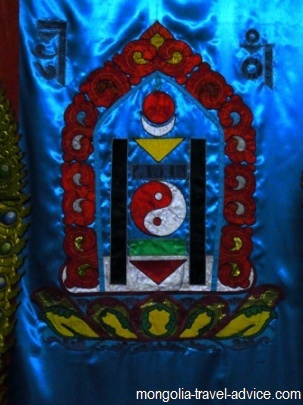 The Soyombo symbol and the colors of the flag manifests Mongolia's Buddhist heritage. The blue symbolizes the colour of the land of the blue sky. It has Buddhist associations with the sky, purity and healing. Blue prayer flags are commongoly left on buddhist ovoos throughout Mongolia. Visitors may be given a blue flag by a local, a special gesture meaning their prayers are with you. The red symbolizes freedom and advancement. 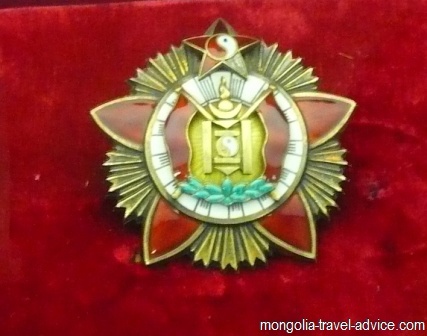 No doubt the communists were content to leave it on the Mongolia flag from 1920s to 1990s due to its associations with Socialism. Mongolia's flag in 1911, after independence was declared from the Chinese. The (gold) Soyombo symbol is the national emblem of Mongolia. It appears in the country's coat of arms. There is a surprising amount of variation in the interpretations of this symbol: every source seems to have its own spin on things. This is because the Soyombo symbol was created by a Buddhist lama over 300 years ago, and most religious scripts and records were burned during Communist repressions, so it's impossible to reach a definitive answer. Starting from the Top: The fire represents eternal growth, revival and renewal, with the three prongs signifying yesterday, today and tomorrow. It sits atop the Sun and Moon, which is more commonly read to symbolize the universe (but it is also interpreted as the origin of the Mongolian people, or that the Mongolians will live forever, depending on what you read). Under this is are symbols taken to be arrows. Their meaning is a willingness to defend their values, or to vanquish their enemies. Between the arrows on the Mongolia flag is a ying-yang symbol (ancient Chinese symbol depicting the complementary dualities of light and dark, man and woman, old and young, etc.). Some say it is a symbol of two fish (the fish meaning vigilance as they never close their eyes) but given the Soyombo was created by a Buddhist with strong links to China I think the yin-yang is far more likely. Surrounding this are two vertical rectangles, which are typcically taken to represent stone walls of a fortress, symbolizing strength and unity. The Soyombo symbol on a communist military medal. The symbol is seen everywhere in Mongolia these days as locals sport it on car stickers, key chains, and even tattoos with meanings as a nationalist or patriotic symbol. During the communist years (but since removed) a 5-point star was placed on top of the fire in the Soyombo symbol. This gold star on a red background signifies that your country has been taken over by an autocratic, authoritarian communist government. It represents forced collectivization, removal of personal freedoms, the wholesale destruction of a nation's history and culture, the execution of the educated and religious classes, and the removal of a capitalist elite to be replaced by an equally corrupt and nepotistic socialist beauracracy....doesn't it? The Soyombo symbol is part of a special Mongolian alphabet called the Soyombo script. 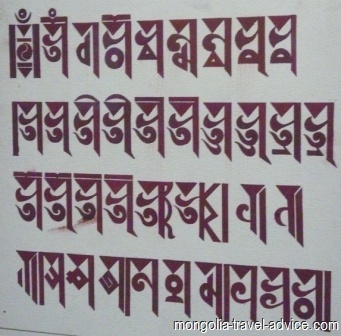 Mongolians of course currently use the Russian cryllic script, and the more commonly-known ancient Mongolian script is a script separate from the script containing the Soyombo symbol. The Mongolian script is still used in Inner Mongolia today, and originated from the Uighur alphabet [the Uighurs are a Turkic people who today form the indiginous minority in Chinese Xinjiang province, which neighbors Chinese inner Mongolia and borders south-western Mongolia]. The Soyombo script includes the symbol on the Mongolia flag, and was created by Zanabazar, a Buddhist leader in Mongolia who died in 1723. Zanabazar was very powerful, and remains one of the most famous historical Mongolian figures after Ghenghis and Kubilai Khan. He was sent to Tibet by Buddhist lamas, and returned to lead the Mongolian lamas and even commanded his own army. He commissioned monasteries allover the country (most were later destroyed by the communists) and was also a brilliant artist and scholar: in between religious teachings he also managed to paint and sculpt some of the best Asian artworks of the times, and invent his own script. Legend has it that Zanabazar saw the script written for him in the sky. He wrote the script to reflect the intonations of the Mongolian language, but it proved difficult to use and its use was limited to decorative inscriptions. You can still see some elements of the script carved into the few monasteries that remain in Mongolia.